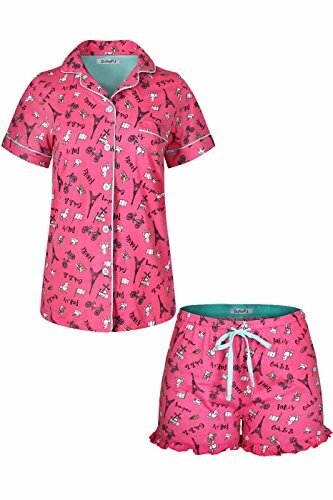 SofiePJProduct DescriptionTwo-piece sleep pajama set featuring short sleeve top and pants. Button-down Top with notch collar lightweight sleepwear. The elastic waist helps the bottoms to loosely hug the hips, while the adjustable drawstring allows you to pull the bottoms as tightly as you like.Product Features The adjustable drawstring waist helps the bottoms to loosely hug the hips. The cute and comfortable short Set will treat yourself or a special woman to something truly beautiful to wear in the bedroom and lounge! The ultimate soft and comfortable Nightdress will give you a custom comfortable fit, making it great for all shapes and sizes including petites, juniors, women's, or missy. -Please refer to the sizing information below to choose the size that best fits you.-Add to your cart now!Sizing Information(INCHES Measured Across)Sizing Chart: -SMALLChest: [33-34] inches Waist: [26-27] inches Hip: [36.5-37.5] inches -MEDIUMChest: [35-36] inches Waist: [28-29] inches Hip: [38.5-39.5] inches -LARGEChest: [37-39] inches Waist: [30-32] inches Hip: [40.5-42.5] inches -EXTRA LARGEChest: [40-41] inches Waist: [33-34] inches Hip: [43.5-44.5] inchesPlease note the size may have 0.5 inch differences due to the manual measurement. Our Sleepyheads poplin cotton short sleeve top and shorts set is ultra lightweight and perfect for sleeping and lounging in warmer weather. The 100% woven cotton material is thin, cool, breathable, and non-clingy. This is a button down notch collar short sleeve top with matching bottoms. The shirt features a front chest pocket and the shorts have an adjustable drawstring waist. This is the perfect sleep set for girls nights or gift for Valentine's Day. Beauty and comfort combine for a luxurious nights sleep. These pretty pjs feature a positive, negative cottage rose print. The front of the tank features a white background with colorful flowers and the back has a colorful background with white flowers. The shorts feature a covered elastic waist band with drawstring for a perfect fit. The silky smooth knit fabric has spandex to stretch and move with you for a comfortable nights sleep. Sweet Dreams Do Come True The right pair of sleepwear can make all the difference in your night's sleep. Wake up refreshed to face a new day after wearing these Womens sleepwear sets. Features a variety of styles, all with a unique feminine flair. 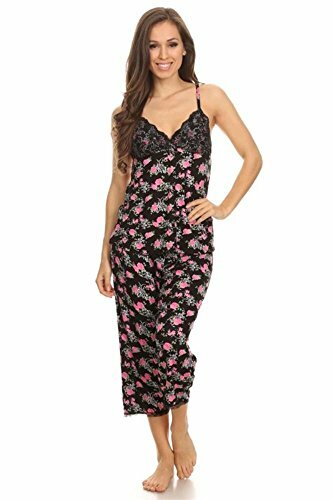 Your Search Ends Here If you are looking for a feel good - look good womens pajama sets, then this is it! Elegant and classic, this two piece womens pajama shorts are great for any woman who favors a sophisticated bedroom set and cares about comfort. Our Womens pajamas short sets come in either a tank top pajama set or cami pajama set. The top features a coordinating womens pjs shorts. Sleepwear that Flatters style that looks great on. These sleepwear sets for women and pajama sets for women have unique detail that complements any bedroom ambiance. Our Commitment to You The Simlu Customer Care Team is knowledgeable and trained to help you till the end with the right knowledge of what makes you happy. Your experience with Simlu lasts long after your purchase. With every wear, feel the rush of confidence. Because that defines the Simlu Experience. Selene knows that when you're laying back and keeping it casual you want to look as great as you feel. With a focus on the softest fabrics, feel-good feminine details, and mix-and-match separates and sets, our line of sleepwear must-haves takes PJs to next level. These beautiful pajamas will surround you in luxurious softness. The super smooth knit fabric features spandex for stretch and will move with you all night long. The tank has a positive and negative cottage rose print. The front has a white background with colored flowers and the back has the colored background with white flowers. The shorts feature a covered elastic waist with drawstring for an adjustable fit. 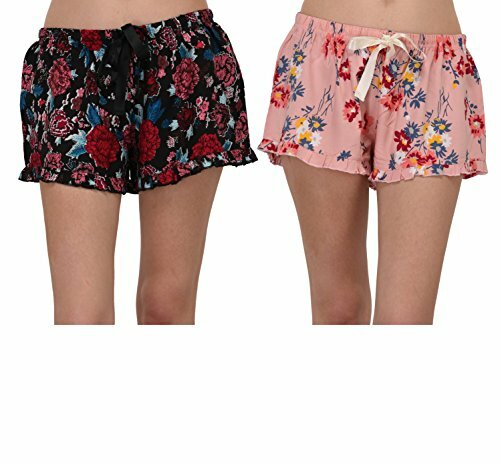 Looking for more Pink Floral Pajama Shorts similar ideas? Try to explore these searches: Cherry Task Seating, Euro Set Table, and Willow Grass. Shopwion.com is the smartest way for comparison shopping: compare prices from most trusted leading online stores for best Pink Floral Pajama Shorts, Canon Mounting Bracket, Silver Plated Shell, Pajama Floral Pink Shorts . 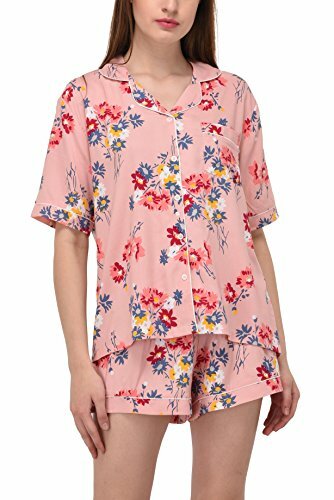 Don't miss this Pink Floral Pajama Shorts today, April 23, 2019 deals, updated daily.